1. Introduction Bibliometrics consist of the application of quantitative techniques to the study of documents’ bibliographic features (Castillo & Xifra, 2006: 147). Literature specialized in bibliometrics is quite abundant. The following authors outstand, among many others: Beniger (1990); Bornmann and others (2008); Brody and others (2007); Bunz (2005); Burnham (1990); Butler (2008); Campbell (2008); Clarke (2007); Cope & Kalantzis (1993, 2010); Cope, Kalantzis & Magee (2011); Cope & Phillips (2013); Craig & Ferguson (2013); Davies (2009); De Solla Price (1965); Dewatripont and others (2006); Edlin & Rubinfeld (2004); Evans (2008); Ferreira et al. (2016); Fink & Bourne (2007); García-Guinea & Sota Rius (1998); Ginsparg (2007); González Quirós & Martín (2009); Guédon (2001); Hannay (2007); Harnad (2009); Harzing & Van Der Wal (2008); Jakubowicz (2009); Jefferson, Wager & Davidoff (2002); Judson (1994); Kousha & Thelwall (2007); Koehler (2001); Lee & Bero (2006); López Baena and others (2005); López Piñero (1972); Mabe & Amin (2002); Mccabe and others (2006); Meho, 2007; Morris (2009); Noyons and others (2009); Norris & Oppenheim (2007); Osca-Lluch and others (2009); Pauly & Stergiou (2008); Pritchard (1969); Schroeder (2007); Simons (2008); Stanley, 2007; Suber, 2007; Tenopir & King (2009); Todd & Ladle (2008); Van De Sompel & Lagoze (2007); Van Leeuwen (2001); Wilbanks (2007); or Willinsky (2006). Bibliometrics studies: Allow knowing the fields in which the topics of a scientific area develop, to know the researches trends, identify research groups (researchers) working therein, to identify the level of international interconnections between researches, the relationship between gender, among researchers, citation styles of other publications, self-citations of publications, self-citations of researchers, research centers they are conducted in (educational, professional, researchers). That is, a set of parameters that allow to stablish a landscape of the research study in a specific field (Castillo & Carretón, 2010: 293). RLCS, Revista Latina de Comunicación Social, 73 – Pages 748 a 764 [Research] | DOI:10.4185/RLCS-2018-1280en | ISSN 1138-5820 | Year 2018 played a relevant role in the global performance of its organization, when generating financial and intangible assets (70% in Spain; 47.9% in the rest of Europe). Almost 70% of Spanish participants of the ECM-2011 considered that the main challenge the professional collective needed to face was the digital evolution and the social web – an issue that had increased 30 points in the preceding five years, followed by a greater connection of communication strategies with the business strategies (58%), the new evaluation methods (29%) and globalization (26.1%). The British study State of the Profession Survey (2014) by Chartered Institute of PR-CIPR (http://www.cipr.co.uk/content/about-us/our-organisation), shows that, in the United Kingdom, a 70% of the 2.531 respondents considered that the essential function of their tasks focused in the design and execution of the communication annual strategic plan, that must offer added-value to organizations. From the PR’s directive perspective and hence, strategic, we were interested in knowing what was the scientific production indicated in WoS, and identify the papers that managed strategy in specialized journals in PR and, in a parallel manner, those of the journals specialized in management that applied PR to their contents and to confirm whether there existed alignments or divergencies between both and, likewise, consistencies with the reference literature. 3. Research questions The main objective in the double research was: (1) to know whether in the sample of journals of PR object of study, the strategic perspective of the discipline was considered, and (2) whether on management journals specialized in strategy, there were specific contents about PR published, between 01.01.00 and 15.07.15 in all cases. As secondary objectives we proposed to know: (a) the years where the greatest number of papers was published; (b) gender issues about authors of analyzed papers; (c) number of authors per paper; and (d) titles of papers, to identify topics managed. Twelve (12) research questions to answer to the different analysis variables that allowed achieving said objectives: (PI1) What are the journals catalogued in the SSCI–Communication–Journal List data base of WoS specialized in PR? (PI2) What are the journals catalogued in the SSCI–Management–Journal List database of WoS specialized in strategy? (PI3) Is the strategic perspective considered in papers published in specialized journals on PR? 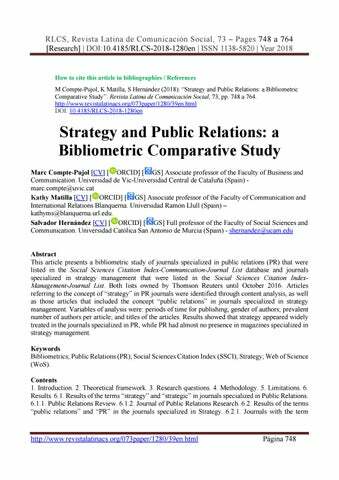 (PI4) Are PR considered in the papers published in management journals specialized on strategy? (PI5) What are the years in which a greater number of papers were published in journals specialized on PR? (PI6) What are the years in which a greater number of papers were published in journals specialized on strategy? (PI7) What is the gender distribution of the papers’ authors in journals specialized on PR? RLCS, Revista Latina de Comunicación Social, 73 – Pages 748 a 764 [Research] | DOI:10.4185/RLCS-2018-1280en | ISSN 1138-5820 | Year 2018 (PI8) What is the gender distribution of the papers’ authors in journals specialized on strategy? (PI9) What is the number of authors by prevailing paper in journals specialized on PR? (PI10) What is the number of authors by prevailing paper in journals specialized on strategy? (PI11) What are the titles of the papers of the journals specialized on PR? (PI12) What are the titles of the papers of the journals specialized on strategy? 4. Methodology For the selection of the sample of the journals specialized in PR, we looked in the universe of the seventy-eight (78) journals catalogued in the SSCI–Communication–Journal List database the ones including the words “public relations” or “PR” in their heading or title. We identified two (2) journals that met this requirement: Public Relations Review (also indexed in Scopus) and Journal of Public Relations Research, on which “Many previous meta-analyses studied that examined research trends in public relations exclusively employed these two as their sample” (Seon-Kyoung & I-Huei, 2012: 71). We proceeded identically with the universe of the one hundred eighty-eight (188) journals of SSCI– Management–Journal List in which title or heading there were the terms “strategy” or “strategic”. Eleven (11) journals complied with these conditions and were added to the sample: Business Strategy and the Environment; Global Strategy Journal; Journal of Economics Management Strategy; Journal of Family Business Strategy (n=4 for the term “strategy”); Advances in Strategic Management–A Research Annual; International Journal of Strategic Property Management; Journal of Strategic Information Systems; Strategic Entrepreneurship Journal; Strategic Organization; Strategic Management Journal; and Technology Analysis & Strategic Management (n=7 for the term “strategic”). All the searches were done from July 20 to July 23, 2015. After identifying the journals, we performed a search through the specific browsers of each one of their official websites. We stablished search parameters in the paper’s title, in abstracts and in keywords. Said parameters were “strategy” and “strategic” for the journals specialized in PR -we didn’t consider words derived thereof, such as “strategically” o “strategies”, despite that in some cases they also appeared in analyzed papers-, and “public relations” and “PR” for the journals specialized in strategy -in the Journal of Family Business Strategy we identified the parameter “PR” on different occasions. Evidencing that it referred to the acronym “Performance Related” papers were discarded, not being included in the study -. The temporary search parameter was delimited to the time period ranged from January 1, 200 and July 15, 2015. The start of the delimitation is justified for the fact that the specialized literature positions at the break of dawn of the new millennium, the broadest development of the academic and professional interest for the strategic praxis of PR and because, from the bibliometrics perspective, it is also there were the massive incorporation to the digital era and digitization of academic journals positions (Cope & Kalantzis, 2009: n/e). RLCS, Revista Latina de Comunicación Social, 73 – Pages 748 a 764 [Research] | DOI:10.4185/RLCS-2018-1280en | ISSN 1138-5820 | Year 2018 The search of the analysis units was done using the WoS website, in English for the terms of analysis variables, because “the role of English is the major language of modern day science” (Van Leeuwen, 2001: 344), therefore “In 1995, for example, English made up over 95% of publications in the Science Citation Index” (Tardy, 2004: 250), becoming the lingua franca (Yukio, 1992: n/e). Once the journals were determined, the following searches were done from their respective corporate websites, also in English. Subsequently, the papers’ lists were debugged, eliminating duplicities. Through the content analysis (Krippendorff, 2004; Wimmer & Dominick, 1996) papers’ analysis variables were transferred to a designed ad hoc template, including: (a) journal’s name; (b) volume, number and publication year, (c) authors’ name and surname, (d) authors’ gender, and (e) title of the paper. They were selected following the methodology and bibliographic parameters inspired in Koehler (2001); Castillo & Xifra (2006); Castillo & Carretón (2010); and Marca and others (2014). Koehler mentions in his research that 62% of papers are written by a single author, followed by two authors (26%), three authors (8%) and more than four (4%). However, this trend modified through the years because in the 50’s the mean was 1.2 authors per paper and in the 90’s it shifted to 1.8 (Koehler, 2001: 122, Cfr. Castillo & Carretón, 2010: 299). The number of authors that participate in papers increases to 378 out of which, 53.7% corresponds to male authors and 46.3% to female authors. In the variable of authors’ gender there is a difference of 7.4 percentage points: men appear more often than women in scientific journals on communication. If we consider the authors’ gender and the number of undersigning individuals in papers, results evidence that men prefer to write papers alone. From the 203 undersigning men, 52.71% do it this way and 23.15% in collaboration with another one. Regarding women, writing a paper as single undersigning party or in collaboration with another author shows a lower difference than men’s case. From the 175 female authors, 41.7% responds to papers of a single author, compared to 32.57% of papers with two authors. Papers with three or more undersigning parties coincide, from the gender analysis, not showing significant differences whatsoever (Castillo & Carretón, 2010: 310). The sum of the papers signed up to two authors is shown in 90.2% of papers […] 25.5% of papers of up to two authors concentrate in those of 1 to 8 pages […] Papers signed by three authors entail 5.1%, […]. Those papers signed by more than 3 authors do not obtain a significant representativeness in global data analyzed (Castillo & Carretón, 2010: 317). 5. Methodology limitations The websites of the totality of journals allow to visualize the research’s analysis variables, except the Journal of Public Relations Research, which does not offer keywords in its papers. On the websites of the journals Public Relations Review and Strategic Management Journal authors’ first names are shown only with their initials, which obliged to perform an individual supplementary search of each one of them through Google and Google Academics browsers (Kousha & Thelwall, 2007; Schroeder, 2007; Harzing & Van Der Wal, 2008) to complete the gender issues [see column 2 of Table 1, Table 2 and Table 6]. RLCS, Revista Latina de Comunicación Social, 73 – Pages 748 a 764 [Research] | DOI:10.4185/RLCS-2018-1280en | ISSN 1138-5820 | Year 2018 6. Results In the descriptive analysis of the double study the results are presented included in tables elaborated by the authors and together with a written description -numeric and in percentages- to make understanding easier. The tables can be consulted on Internet using their respective links as follows: Table 1. The term “strategy” in Public Relations Review. https://issuu.com/marc532/docs/tabla_1_5961b28fce4543 Table 2. The term “strategic” in Public Relations Review. https://issuu.com/marc532/docs/tabla_2_9aa1838d09af53 Table 3. The term “strategy” in Journal of Public Relations Research. https://issuu.com/marc532/docs/tabla_3 Table 4. The term “strategic” in Journal of Public Relations Research. https://issuu.com/marc532/docs/tabla_4 Table 5. The terms “public relations” and “PR” in the “strategy” journals. https://issuu.com/marc532/docs/tabla_5 Table 6. The terms “public relations” and “PR” in the “strategic” journals. https://issuu.com/marc532/docs/tabla_6 6.1. Results of the terms “strategy” and “strategic” in the public relations journals 6.1.1. Public Relations Review After eliminating 12 duplicities, we identified 207 valid papers for the study, of which 102 (49.27%) complied with the search requirements “strategy” and 105 (50.72%) with “strategic”. We counted a total of 412 authors (average of 1.99 authors/paper). The 102 “strategy” papers were written by 203 authors, out of which 94 (46.30%) were men and 109 (53.69%) women. The 105 “strategic” papers were written by the hands of 209 (50.72%) authors, out of which 82 (39.23%) were men and 127 (60.76%) belonged to the female gender. Out of the total of 207 papers, thus, 176 were written by men (42.71%) compared to the 236 (57.28%) mostly written by female authorship. “Strategy” papers (n=102) written by 2 authors (48-47.05%), followed by the 34 (33.33%) papers written by 1 author, 15 (14.70%) written by 3 authors, 3 (2.94%) written by 4 authors and 2 (1.96%) of 5 authors. Regarding the “Strategic” papers (n=105) are mainly written by 1 author (48-45.71%), followed by 35 (33.33%) papers written by 2 authors, 15 (14.28%) written by 3 authors and 7 (6.66%) which authorship is thanks to 4 individuals. RLCS, Revista Latina de Comunicación Social, 73 – Pages 748 a 764 [Research] | DOI:10.4185/RLCS-2018-1280en | ISSN 1138-5820 | Year 2018 In the analyzed period “strategy” and “strategic” papers were published, which met search criteria every year, except in 2001, where no “strategy” paper was published in 2006, where no paper with the “strategic parameter” was published. In the “strategy” papers (n=102) in 2000 and 2003 a single paper was published (0.98%); in 2002 there were published 2 (1.96%); in 2004, 4 (3.92%); in 2006 and 2007, 5 (4.90%); in 2005 and 2011, 6 (5.88%); in 2010, 7 (6.86%); in 2009 and 2013, 8 (7.84%); in 2015 (until 15.07.15), 9 (8.82%); in 2008, 12 (11.76%); in 2014, 13 (12.74%); and in 2012, 16 (15.68%), being then 2012 the year when more “strategy” papers were published (15.68%). In the “strategic” papers (n=105) only 1 (0.95%) paper was published in 2001; 2 (1.90%) in 2008; 3 (2.85%) in 2002 and 2003; 4 (3.80%) in 2000; 5 (4.76%) in 2004 and 2015 (until 15.07.15); 6 (5.71%) in 2007 and 2011; 7 (6.66%) in 2010; 8 (7.61%) in 2005 and 2013; 15 (14.28%) in 2009 and 2012; and 18 (17.14%) in 2014 which is, then the year where more papers were published with the “strategic” search criteria (17.14%). See titles of papers on Table 1 (“strategy”) and Table 2 (“strategic”). 6.1.2. Journal of Public Relations Research A total of 46 papers were identified, which adapted to the search criteria: 28 “strategy” (60.86%) and 18 “strategic” (39.13%), after debugging duplicities. The 46 papers were written by a total of 95 authors (average of 2.06 authors/ paper). Out of the 50 “strategy” authors (52.63%), 19 (38.00%) were written by men and 31 (62.00%) by women. Out of the 45 “strategic” authors (47.3%), 24 (53.33%) were men and 21 (46.66%), women. The 28 “strategy” papers were mainly written by 1 author (13-46.42%) and the 18 “strategic” papers were written predominantly by 2 authors (7-38.88%). In the analyzed period there were “strategy” y “strategic” papers published almost every year, except in 2001, 2002 and 2007 for “strategy” and in 2001, 2002, 2003, 2010 and 2015 for “strategic”. Out of the 28 “strategy” papers, the years when more papers were published were 2006, 2008 and 2010 with 4 (14.28%) papers/ year. Out of the 18 “strategic” papers, 2009, 2013 and 2014 where the years with a greater number of published papers (3-16.66%). See the titles of papers on Table 3 (“strategy”) and Table 4 (“strategic”). 6.2. Results of the terms “public relations” and “PR” in the journals specialized in Strategy 6.2.1. “Strategy” journals • Global Strategy Journal; Journal of Economics Management Strategy; and Journal of Family Business Strategy– No paper was identified after using the search parameters “public relations” or “PR” in the analyzed period. RLCS, Revista Latina de Comunicación Social, 73 – Pages 748 a 764 [Research] | DOI:10.4185/RLCS-2018-1280en | ISSN 1138-5820 | Year 2018 • Business Strategy and the Environment– We located a single paper that met search parameters, published in 2009 and of a single author, man. The paper titled “Social and Environmental Reporting and the Corporate Ego”, handles about “the results of a qualitative exploration into the target audiences for social and environmental reporting (SER)” and concludes that “broader stakeholders might be targeted with SER only insofar as doing so serves as a perceived endorsement of organizational communications, thereby embellishing the corporate ego’s fantasy of how it would like to be perceived” (Crawford, 2009: 254). 6.2.2. “Strategic” journals • Advances in Strategic Management– A Research Annual; Journal of Strategic Information Systems; International Journal of Strategic Property Management; Strategic Entrepreneurship Journal; and Strategic Organization – No paper was identified after using the search parameters “public relations” or “PR” in the analyzed period. • Strategic Management Journal- We located a single paper that met the search parameters, published in 2003, by two authors, both men. The paper titled “Mapping moral philosophies: Strategic implications for multinational firms” explains, from the perspective of ethical decision making models how “Strategic managers appear increasingly under pressure from stakeholder concerns regarding social and ethical issues” (Robertson and Crittenden, 2003: 385). None of the authors is PR specialist. • Technology Analysis & Strategic Management- Single paper, titled “Meeting the challenge of aviation emissions: an aircraft industry perspective” matched search criteria. Published in 2009, by a single author and a man and, in the context of climate change, it talks about the role that CO2 emissions and NOx of planes play and, in a tangential manner, about the PR campaign about aviation industry boosted by “green lobby groups, other NGOs and parts of the media” (Lawrence, 2009: 80). The author is not specialized in PR. RLCS, Revista Latina de Comunicación Social, 73 – Pages 748 a 764 [Research] | DOI:10.4185/RLCS-2018-1280en | ISSN 1138-5820 | Year 2018 more likely to be viewed as non-standard and to be excluded from publication (Bhatia, 1997 & Kaplan, 2001)”. The time periods when a greater number of papers was published on journals specialized in PR were the years 2012 (“strategy”, 16-15, 68%) and 2014 (“strategic”, 18-17, 14%) for Public Relations Review. And the years 2006, 2008 and 2010 (“strategy” 4-14, 28%) and 2009, 2013 and 2014 (“strategic” 3, 16,66%) for Journal of Public Relations Research (PI5). In Public Relations Review no article was published in the years 2001 and 2006, and in Journal of Public Relations Research the years 2001, 2002, 2003, 2007, 2010 and 2015 (up to 15.07.15). The scarce presence of papers about PR in the eleven (11) journals specialized on strategy do not allow to extract significant conclusions regarding the periods with a higher number of papers published (PI6). The gender distribution in Public Relations Review is 92 (46.03%) men and 109 (53.69%) women for “strategy”; and 82 (39.23%) men and 127 (60.76%) women for “strategic”. In Journal of Public Relations Research, it is 19 (38.00%) men and 31 (62.00%) women for “strategy” and 24 (53.33%) men and 21 (46.66%) women for “strategic”. Female authors are prevalent in the group of authors of these two journals (except in the last case), in contradiction with Castillo & Carretón (2010: 310), who identified a supremacy of male authors in their study. Data are not coherent with the gender parity of Spanish journals studied by MÍguez, Baamonde & Corbacho (2014), except in the last case, where it is complied with (PI7). Neither in this occasion it is possible to extract significant conclusions about the authors’ gender of the eleven (11) journals specialized on strategies due to the very scarce volumes published (PI8), although we highlight that the male authorship is complete. The prevalence of the number of authors by paper in specialized journals on PR is 2 authors (48-47, 05%) for “strategy” and 1 author (48-45, 71%) for “strategic” in Public Relations Review and of 1 author (13-46, 42%) for “strategy” and 2 authors (7-38, 88%) for “strategic” in Journal of Public Relations Research, consistent with Koehler (2001: 122) -1,8 authors in the decade of 1990- and with Castillo & Carretón (2010: 317) -2 authors in 90.00% of cases- (PI9). Regarding the scarce number of authors (4) out of the 3 scarce papers of the 11 journals specialized on strategy it is not possible to extract significant conclusions (PI10). The titles of papers of journals specialized in PR are allocated in the fifth column of Tables 1, 2, 3 and 4 (PI11) and of the papers of journals specialized on strategy are described in the fifth column of Tables 5 and 6 (PI12). The bibliometrics analysis shows that the treatment of the strategy applied to PR is very abundant in the two journals specialized in PR, which confirms the reference literature regarding the interest shown by the authors of the sample due to the directive function of PR professionals as heads of an independent department (Prat Gaballí, 1958; Matrat, 1970: 27, 37-49; Arnaldi, 1971: 217; Ugeux, 1973: 32-33; Ledigham & Bruning, 2000; Van Ruler, 2000; Van Ruler and others 2000, 2004; Van Ruler & Verčič, 2002, 2004) and, subsequently, regarding their functional limits and their level of responsibility in the design and the execution of the strategic communication plan and their contribution of the corporate strategic plan; about the accountability process and to whom report them hierarchically; as well as its possible Integration in the management committee, consistent with results of the studies ECM-European Communication Monitor (2011) and State of the Profession Survey (2014). RLCS, Revista Latina de Comunicación Social, 73 – Pages 748 a 764 [Research] | DOI:10.4185/RLCS-2018-1280en | ISSN 1138-5820 | Year 2018 Nevertheless, the interest shown by authors of management journals specialized on strategy points to the opposite direction, because we do not observe that the debate regarding the PR department and the functions and responsibilities of its managerial staff, from any of its possible perspectives regarding business administration in its broader sense, has a similar correspondence in the very scarce, otherwise almost nonexistent papers identified. Likewise, the interest for other possible thematic orientations of PR of a more general scope and not exclusively focused in the management of communication is confirmed, almost null as well (except, perhaps, of Crawford, 2009) and even though the scarce results do not allow to extract significant conclusions from a statistical perspective, we say that, based on empirical evidence, PR do not constitute the main topic treated, which might have its logic in the fact that none of the authors of the papers is specialist in that field. On future researches we intent to perform methodologically identical studies, with wider study samples, such as Scopus; or Latindex, RESH and IN-RECS (*) -not in English language (Van Leeuwen, 2001; Yukio, 1992)-, to obtain evidences and develop, subsequently, successive comparative studies and to identify possible deviations, if any, as a result of the linguistic diversity (Tardy, 2004). RLCS, Revista Latina de Comunicación Social, 73 – Pages 748 a 764 [Research] | DOI:10.4185/RLCS-2018-1280en | ISSN 1138-5820 | Year 2018 Simposio de la Asociación de Investigadores en Comunicación del Estado Español (AICE), Madrid. Campell, PH. (2008). Escape from the impact factor. Ethics in Science and Environmental Politics, 8, p. 5–7. Castillo, A., & Carretón, Mª C. (2010). Investigación en Comunicación. Estudio bibliométrico de las revistas de Comunicación en España. Comunicación y Sociedad, 13(2), p. 289-327. Castillo, A., & Rubio, A. (2010). “La calidad de indización en las bases de datos científicas sobre Comunicación. Estudio comparativo de las revistas con mayor índice de impacto según el ISI del Journal Citations Reports”, Congreso Comunicación y Desarrollo en la Era Digital, 3- 5 febrero 2010, Málaga. Castillo, A., & Xifra, J. (2006). Investigación bibliométrica de las tesis doctorales españolas sobre Relaciones Públicas, Anàlisi, 34, p. 141-161. Castillo-Esparcia, A., Rubio-Moraga, A., & Almansa-Martínez, A. (2012). La investigación en Comunicación. Análisis bibliométrico de las revistas de mayor impacto del ISI. Revista Latina de Comunicación Social, 67, p. 248-270. Chaumely, J., & Huisman, D. (1963). Les Relations Publiques. París: P.U.F. Clarke, R. (2007). The cost profiles of alternative approaches to journal publishing. First Monday, 12(12), (December). Compte-Pujol, M., De Urquijo, B., & Matilla, K. (2016). La investigación en marcas de territorio y diplomacia pública en España. Un estudio bibliométrico de las revistas científicas españolas especializadas en Comunicación indexadas en Latindex (1980-2016). Anales de Documentación, 19(2), p. 1-53. Cope, B., & Kalantzis, M. (1993). “Introduction: How a Genre Approach to Literacy can Transform the Way Writing is Taught”. En B. Cope & M. Kalantzis (eds. ), The Powers of Literacy: A genre approach to teaching writing (pp. 1-21). London: Falmer Press. Cope, B., & Kalantzis, M. (2009). Signs of Epistemic Disruption: Transformations in the Knowledge System of the Academic Journal. First Monday, 14(4, 06.04.09, [s.n. ], 2009. Cope, B., & Kalantzis, M. (2010). Evaluating Webs of Knowledge: A Critical Examination of the ‘Impact Factor’. Logos: The Journal of the World Book Community, 21, p. 117-132. Cope, B., Kalantzis, M. & Magee, L. (2011). Towards a Semantic Web: Connecting Knowledge in Academic Research. Cambridge, UK: Woodhead Publishing. Cope, B., & Phillips, A. (eds.) (2013). The Future of the Academic Journal. Oxford, UK: Chandos, 2ª ed. Craig, I.D., & Ferguson, L. (2009). “Journals ranking and impact factors: How the performance of journals is measured”. En: B. Cope & M. Kalantzis (eds). The future of the academic journal. Oxford, UK: Chandos, 2ª ed. Cutlip, S. (1995). Public Relations History: From the 17th to the 20th Century. The Antecedents. New Jersey, NJ: Lawrence Erlbaum. RLCS, Revista Latina de Comunicación Social, 73 – Pages 748 a 764 [Research] | DOI:10.4185/RLCS-2018-1280en | ISSN 1138-5820 | Year 2018 Davies, J.E. (2009). “Libraries and the future of the journal: Dodging the crossfire in the e– revolution; or leading the charge?”. En: B. Cope & A. Phillips (eds). The future of the academic journal. Oxford, UK: Chandos, 2ª ed. De Solla Price, D.J. (1965). Networks of Scientific Papers. The pattern of bibliographic references indicates the nature of the scientific research front. Science, 149, 30 july, p. 510-515. Dewatripont, M., Ginsburgh, V., Legros, P., & Walckiers, A. (2006). Study on the economic and technical evolution of the scientific publication markets in Europe. Brussels: European Commission. Edlin, A.S., & Rubinfeld, D.L. (2004). Exclusion or efficient pricing? The ‘big deal’ bundling of academic journals, Berkeley, CA: University of California. Evans, J.A. (2008). Electronic publication and the narrowing of science and scholarship, Science, 321(5887), 18 Julio), p. 395–399. Ferreira, J., Fernandes, C., & Ratten, V. (2016). A co-citation bibliometric analysis of strategic management research. Scientometrics, 109(1), p. 1-32. Fink, J.L., & Bourne, (2007). Ph.E. Reinventing scholarly communication for the electronic age, CTWatch Quarterly, 3. Fusell Sisco, H., Pressgrove, G., & Collins, E.L. (2013). Paralleling the Practice: An Analysis of the Scholarly Literature in Nonprofit Public Relations, Journal of Public Relations Research, 25(4), p. 282-306. García-Guinea, J., & Sota Rius, J., de la. (1998). Las consecuencias de publicar en revistas científicas escritas en español en España, Interciencia, 23(3), p. 185-187. Ginsparg, P. (2007). Next–generation implications of open access. CT Watch Quarterly, 3. Goldman, E.F. (1948). Two-Way Street: The Emergence of the Public Relations Counsel. Boston, MA: Bellman. González Quirós, J.L., & Martín, K.G. (2009). “Arguments for an open model of science”. En B. Cope & A. Phillips (eds). The future of the academic journal. Oxford, UK: Chandos, 2ª ed. Guedón, J.-C. (2001). In Oldenburg’s long shadow: Librarians, research scientists, publishers, and the control of scientific publishing. Association of Research Libraries. Hannay, T. (2007). Web 2.0 in science. CT Watch Quarterly, 3. Harnad, S. (2008). Validating research performance metrics against peer rankings. Ethics in Science and Environmental Politics, 8, p. 103–107. Harnad, S. (2009). “The Post-Gutenberg open access journal”. En B. Cope & A. Phillips (eds. ), The future of the academic journal. Oxford, UK: Chandos, 2ª ed. Harzing, A.-W. K., & Van der Wal, R. (2008). Google Scholar as a new source for citation analysis. Ethics in Science and Environmental Politics, 8, p. 61–73. Jakubowicz, A. (2009). Beyond the static text: Multimedia interactivity in academic publishing. En: B. Cope & A. Phillips (eds. ), The future of the academic journal. Oxford, UK: Chandos, 2ª ed. RLCS, Revista Latina de Comunicación Social, 73 – Pages 748 a 764 [Research] | DOI:10.4185/RLCS-2018-1280en | ISSN 1138-5820 | Year 2018 Jefferson, T., Wager, E., & Davidoff, F. (2002). Measuring the quality of editorial peer review. Journal of the American Medical Association, 287, p. 2786–2790. Jones, D.E. (1997). Investigació sobre comunicació social a l’Espanya de les autonomies. Anàlisi, 21, p. 101-120. Judson, H.F. (1994). Structural transformations of the sciences and the end of peer review. Journal of the American Medical Association, 272, p. 92–94. Ki, E.-J., & Shin; J.-H. (2006). Status of organization–public relationship research from an analysis of published articles, 1985–2004. Public Relations Review, 32(2), p. 194-195. Kim S.-Y., Choi, M.-I., Reber, B.H., & Kim, D. (2014). Tracking public relations scholarship trends: Using semantic network analysis on PR Journals from 1975 to 2011. Public Relations Review, 40(1), p. 116-118. Koehler, W. (2001). Information science as ‘Little Science’: The implications of a bibliometric analysis of the Journal of the American Society for Information Science. Scientometrics, 51(1), p. 117-132. Kousha, K., & Thelwall, M. (2007). Google Scholar citations and Google Web/URL citations: A multi–discipline exploratory analysis. Journal of the American Society for Information Science and Technology, 5(7), p. 1055–1065. Krippendorff, K. (2004). Content Analysis: An Introduction to Its Methodology. Thousand Oaks, CA: Sage, 2ª ed. Lauf, E. (2005). National diversity of major international journals in the field of communication. Journal of Communication, 55(1), p. 139-151. Ledingham, J.A., & BruningR, S.D. (2000). Public Relations as Relationship Management. A Relational Approach to the Study and Practice of Public Relations, Mahwah, NJ: Lawrence Erlbaum. Lee, K., & Bero, L. (2006). What authors, editors and reviewers should do to improve peer review. Nature. Lievrow, L.A. (1990). “Reconciling structure and process in the study of scholarly communication”. En C. L. Borgman (Ed. ), Scholarly Communication and Bibliometrics (pp. 59–72). Newbury Park, CA: Sage. López Baena, A.J., Valcárcel Cases, M., & Barbancho Medina, M. (2005). Propuesta de un sistema de evaluación de revistas científicas en las áreas de ciencias humanas y sociales. Revista Española de Documentación Científica, 28(1), p. 222-248. López Piñero, J.M. (1972). El análisis estadístico y sociométrico de la literatura científica. Valencia: Centro de Documentación e Informática Médica de la Facultad de Medicina. Mabe, M.A., & Amin, M. (2002). Dr. Jekyll and Dr. Hyde: Author–reader asymmetries in scholarly publishing. Aslib Proceedings, 54, p. 149–157. RLCS, Revista Latina de Comunicación Social, 73 – Pages 748 a 764 [Research] | DOI:10.4185/RLCS-2018-1280en | ISSN 1138-5820 | Year 2018 Marca-Francés, G., Matilla, K., & Ortiga-Fontgivell, B. (2014). Las revistas académicas de comunicación en salud y de relaciones públicas: un análisis bibliométrico comparativo. En K. Matilla (Coord. ), Cambio social y Relaciones Públicas (pp. 87-100). Barcelona: UOC. Martínez Nicolás, M. (2009). La investigación sobre comunicación en España. Evolución histórica y retos actuales. Revista Latina de Comunicación Social, 64. Martínez Nicolás, M. & Saperas-Lapiedra, E. (2016). Objetos de estudio y orientación metodológica de la reciente investigación sobre comunicación en España (2008-2014): Análisis de los trabajos publicados en revistas científicas españolas. Revista Latina de Comunicación Social, 71, p. 1.3651.384. Matilla, K., Oliveira, A., & Compte-Pujol, M. (2015). Strategy and Public Relations in Europe during the 21st Century: Is there a gap between praxis and academia? Wulfenia Journal, 2(22), feb. Matrat, L. (1970). Relations Publiques et Management. Bruxelles: CERP. McCabe, M.J., Nevo, A., & Rubinfeld, D.L. (2006). The pricing of academic journals. Berkeley, CA: University of California. McNutt, M. (2014). Be one of the first. Science, 19 September, 345(6203). Meho, L.I. (2007). The rise and rise of citation analysis. Physics World, 20, p. 32–36. Míguez-González, M., Baamonde-Silva, X.M., & Corbacho-Valencia, J.M. (2014). A bibliographic study of public relations in Spanish media and communication journals, 2000-2012, Public Relations Review, 40(5), p. 818–828. Míguez-González, M., Corbacho-Valencia, & J., Baamonde-Silva, X. (2016). Tendencias de investigación sobre relaciones públicas en revistas internacionales: el caso del ‘Journal of Public Relations Research’ 2012-2014. Revista Internacional de Relaciones Públicas, 12(6), p. 5-24. Moloney, K. (2000). Rethinking Public Relations. The Spin and the Substance. London, UK: Routledge. Morris, S. (2009). “The tiger in the corner: Perhaps journals will not be central to the lives of tomorrow’s scholars?”. En B. Cope & A. Phillips (eds). The future of the academic journal. Oxford, UK: Chandos, 2ª ed. Nessmann, K. (1995). Public Relations in Europe: a comparison with the United States. Public Relations Review, 21(2), p. 151-160. Norris, M., & Oppenheim, Ch. (2007). Comparing alternatives to the Web of Science for coverage of the social sciences’ literature. Journal of Informetrics, 1(2), p. 161–169. Noyons, E.C.M., Moed, H.F., & Luwel, M. (1999). Combining mapping and citation analysis for evaluative bibliometric purposes: A bibliometric study. Journal of the American Society for Information Science, 50(2), p. 115-131. Osca-Lluch, J., Velasco, E., López, M., & Haba, J. (2009). Co-authorship and citation networks in Spanish history of science research, Scientometrics, 80(2), p. 373-385. RLCS, Revista Latina de Comunicación Social, 73 – Pages 748 a 764 [Research] | DOI:10.4185/RLCS-2018-1280en | ISSN 1138-5820 | Year 2018 Paisley, W. (1989). Bibliometrics, scholarly, communication and communication research. Communication Research, 16, p. 701-717. Pasadeos, Y., & Renfro, B. (1989). A citation study of public relations research 1975-1986. Public Relations Review, 15(3), p. 48-50. Pasadeos, Y., & Renfro, B. (1992). A bibliometric analysis of public relations research. Journal of Public Relations Research, 4(3), p. 167-187. Pasadeos, Y., Renfro, B. & Hanily, M. (1999). Influential authors and works of public relations scholarly literature: A network of recent research. Journal of Public Relations Research, 11(1), p. 29-52. Pasadeos, Y., Berger, B., & Renfro, B. (2010). Public relations as a maturing discipline: An update on research networks. Journal of Public Relations Research, 22(2), p. 136-158. Pauly, D., & Stergiou, K.I. (2008). Re–interpretation of ‘influence weight’ as a citation–based Index of New Knowledge (INK). Ethics in Science and Environmental Politics, 8, p. 75–78. Prat Gaballí, P. (1958). “Prefacio”. En W.A. Nielander y R.W. Miller, Relaciones Públicas. Cómo Método para crear prestigio y promover ventas. Barcelona: Hispano Europea. Pritchard, A. (1969). Statistical Bibliography or Bibliometrics? Journal of Documentation, 25(4), p. 348-349. Roca-Correa, D., & Pueyo-Ayhan, N. (2012). La productividad científica en Comunicación a través de la revista ‘Zer’. Revista Latina de Comunicación Social, 67, p. 292-321. Sallot, L.M., Lyon, L.J., Acosta-Alzuru, C., & Jones, K.O. (2003). From aardvark to zebra: A new millennium analysis of theory development in public relations academic journals. Journal of Public Relations Research, 15(1), p. 27-90. Schroeder, R. (2007). Pointing users toward citation searching: Using Google Scholar and Web of Science. Libraries and the Academy, 7, p. 243–248. Seon-Kyoung, A., & I-Huei, CH. (2012). “Crisis Communication Research in Public Relations Journals. Tracking Research Trends Over Thirty Years”. En T. Coombs & S. J. Holladay (Eds. ), The Handbook of Crisis Communication (65-90). Chichester, UK: Wiley-Blackwell. Simons, K. (2008). The misused impact factor. Science, 322(5899) (10 October), 165. So, C. (1988). Citation patterns of core communication journal: An assessment of the development status of communication. Human Communication Research, 15(2), p. 236–255. Stanley, CH.A. (2007). When counter narratives meet master narratives in the journal editorial– review process. Educational Researcher, 36, p. 14–24. Suber, P. (2007). Trends favoring open acces. CT Watch Quarterly, 3. Tardy, C. (2004). The role of English in scientific communication: lingua franca or Tyrannosaurus rex? Journal of English for Academic Purposes, 3(3), p. 247-269. RLCS, Revista Latina de Comunicación Social, 73 – Pages 748 a 764 [Research] | DOI:10.4185/RLCS-2018-1280en | ISSN 1138-5820 | Year 2018 Article received on 18 January 2018. Accepted on 15 April. Published on 19 April 2018.